This specimen from Madagascar has a bluish cast that may indicate a composition similar to those grains found in meteorites. Credit: Rock Currier. Mineralogy is the scientific study of minerals. Minerals are solid crystalline substances of natural occurrence. This shows sharp and lustrous, chocolate-colored eudialyte crystals associated with black aegirine from very close to the Type Locality in Greenland. Credit: Rob Lavinsky. Def. "a solid, homogeneous, crystalline chemical element or compound that results from natural usually inorganic processes" or any "naturally occurring usually inorganic material that has a (more or less) definite chemical composition and characteristic physical properties" is called a mineral. "a science dealing with minerals, their crystallography, physical and chemical properties, classification, and the ways of distinguishing them"
These specimens are some of the most easily recognizable, dramatic and highly sought after silver specimens from the Western Hemisphere. Credit: Robert Lavinsky. Def. any "of a number of chemical elements in the periodic table that form a metallic bond with other metal atoms; generally shiny, somewhat malleable and hard, often a conductor of heat and electricity" is called a metal. Metals can be divided into alkali metals; alkaline, or alkali, earth metals; metalloids such as boron, gallium, and mercury; transition metals like iron, niobium, and tungsten; precious metals such as palladium, silver, rhenium, osmium, iridium, platinum, and gold; and post-transition metals like germanium, antimony, and bismuth. Some metals with higher atomic numbers and weights are considered heavy metals: cadmium, indium, tin, mercury, thallium, lead, and bismuth. Metals constitute a large portion of the Periodic Table of elements. Their combinations with each other and the other elements result in the minerals that compose rocky-objects. Generally, the transition metals constitute the periodic table of elements from groups 3-12, beginning with scandium (Sc) and ending with element number 112 Copernicium. Metalloids - gallium (Ga) through selenium (Se) and cadmium (Cd) through tellurium (Te). Alkaline earth metals - group 2: beryllium (Be) through radium (Ra). Alkali metals - group 1: lithium (Li) through francium (Fr). Body-centered cubic metals - titanium (Ti) through chromium (Cr), zirconium (Zr) through molybdenum (Mo), and hafnium (Hf) through tungsten (W). Heavy metals - mercury (Hg) through polonium (Po). Lanthanides - lanthanum (La) through lutetium (Lu), also called the rare-earths. Precious metals - ruthenium (Ru) through silver (Ag) and rhenium (Re) through gold (Au). Transition metals are often restricted to manganese (Mn), iron (Fe), cobalt (Co), nickel (Ni), copper (Cu), and zinc (Zn). Transuranics - neptunium (Np) through Roentgenium (Rg) and Copernicium (Cn). The category of metals also includes aluminum, scandium (Sc), yttrium (Y), technetium (Tc), and the actinides. This is a sodium chloride crystal of the mineral halite. Credit: United States Geological Survey and the Mineral Information Institute. The alkalis, or alkali metals, are the group 1 elements of the Periodic Table. In addition to the true metals: lithium (Li), sodium (Na), potassium (K), rubidium (Rb), caesium (Cs), and francium (Fr), hydrogen (H) is usually included. Each of the elements in group 1 has or may have native mineral occurrences on Earth or elsewhere nearby. Various minerals contain significant amounts of the alkali metals: Li, Na, K, Rb, and Cs. Trace amounts of Fr occur. Tarapacaite is a natural mineral pigment composed of potassium chromate which is a likely source of yellow. This is a beryllium-chromium phase diagram. Credit: M. Venkatraman and J.P. Neumann. The alkaline earth metals are the elements in Group 2 of the Periodic Table: beryllium (Be), magnesium (Mg), calcium (Ca), strontium (Sr), barium (Ba), and radium (Ra). Beryllium occurs in a hexgonal close-packed (hcp) crystal structure at room temperature (α-Be). As indicated in the phase diagram on the left beryllium occurs as (β-Be) which is bcc at higher temperatures up to melting. Native beryllium is not known to occur on the surface of the Earth, but may eventually be found among beryllium-bearing minerals in small amounts. The elements Be, Mg, Ca, Sr, Ba, and Ra are common in minerals such as calcite which makes up rocks such as limestone and dolomite. Calcite is a common calcium carbonate mineral that occurs as orange. Credit: . Calcite on the right is a common calcium carbonate mineral that occurs in orange. For its calcium content it is an alkaline earth mineral, for its carbon and carbonate content it is a carbonide, and is a chalcogen as an oxide. Def. an "element, such as silicon or germanium, intermediate in properties between that of a metal and a nonmetal; especially one that exhibits the external characteristics of a metal, but behaves chemically more as a nonmetal" is called a metalloid. Metalloids include boron, carbon, aluminum, silicon, phosphorus, and arsenic. Metalloids are elements whose properties are intermediate between metals and solid nonmetals or semiconductors. astatine, here is with the halogens. These borax crystals are from Kramer, California, USA. Credit: Aram Dulyan. Boron occurs primarily on Earth as an oxide, or borate, such as borax, imaged on the top right. "Mineral subclasses apply to the borate and silicate classes, where the configuration and bonding of tetrahedra are used to group structurally similar minerals. The subclasses are: neso-, soro-, cyclo-, ino-, phyllo- and tectosilicates(borates). Traditionally the borates are divided into monoborates, diborates, triborates, tetraborates etc. (e.g. Strunz & Nickel, 2001), however, enough structural data is known to base classification of borates on the polymerisation of the borate anion." The mineral Lonsdaleite is made from carbon with a different arrangement than diamond. Credit: payam. Although carbonide is an archaic term for carbide, here it may serve to classify carbon based minerals including carbonates, carbides, and hydrocarbons. Carbonides are naturally occurring minerals composed of 50 atomic percent, or more, carbon. Carbonide-like minerals with greater than 25 at % carbon are also included. This separates carbon containing minerals from carbonates which are at most 25 at % carbon. "The mineral Lonsdaleite [on the right] is a translucent, brownish yellow and is made from the atoms of carbon but the arrangement of these atoms is different from the arrangement of carbon atoms in a diamond. [...] The mineral is very rare and is formed naturally whenever [...] graphite containing meteorites fall on the earth and hit the surface." This image shows a diamond already removed from its natural location in a rock. Credit: Eurico Zimbres FGEL/UERJ. Def. a "naturally occurring, glimmering glass-like allotrope of carbon in which each atom is surrounded by four others in the form of a tetrahedron" is called a diamond. Radial spray of highly lustrous, canary-yellow carpathite lathes reach to 2.0 cm. Credit: Rob Lavinsky. Def. a solid, homogeneous, monoclinic (space group P2/c, no. 13, or P21/c, no. 14), naturally occurring, chemical compound with the formula C24H12 that results from natural inorganic processes is called a carpathite. Malachite is a mineral occurring on Earth, like many greens, is colored by the presence of copper, specifically by basic copper(II) carbonate. Credit: Rob Lavinsky. Malachite is a mineral that occurs in rocks at or near the interface between Earth's atmosphere and crust. It is a copper carbonate hydroxide mineral. Near the top center of this image is a gray reflective flake of native aluminum. Credit: Vasil Arnaudov. Def. any "intermetallic compound of aluminium and a more electropositive element" is called an aluminide. The aluminides are those naturally occurring minerals with a high atomic % aluminum. In the image on the right of a flake of native aluminum, the scale bar = 1 mm. Aluminium is the third most abundant element (after oxygen and silicon) in the Earth's crust, and the most abundant metal there. It makes up about 8% by mass of the crust, though it is less common in the mantle below. As a mineral occurrence, aluminum is mostly an oxide. Aluminum metal is recovered from minerals such as bauxite. Credit: USGS. On the right is an example of bauxite, which is the main rock (ore) from which aluminum is recovered. "The major aluminum phases recognised in bauxites and laterites are gibbsite also known as hydrargillite (γ-Al(OH)3), and boehmite (γ-AlO(OH))." "Gibbsite is the main mineral in bauxites formed in areas characterized by a tropical climate with alternating rainy and dry periods (monsoon). Bauxites with primarily boehmite appear to be more constrained to the subtropical areas (Mediterranean type bauxite). Thermal action or low-grade metamorphism mostly favors diaspore formation. Furthermore, diaspore is formed as a minor constituent in many types of bauxite in addition to gibbsite and boehmite [1-3]." This raw sapphire is from Madagascar. Credit: Kluka. Perhaps the most common violet mineral is sapphire. A sample of uncut natural sapphire is at lowest right. Sapphires may be found naturally, by searching through certain sediments (due to their resistance to being eroded compared to softer stones) or rock formations. These are quartz crystals from Tibet. Credit: JJ Harrison. The chalcogen minerals contain significant quantities of oxygen, sulfur, selenium, tellurium and polonium. Quartz is composed of SiO2. Two atoms of oxygen are present for one atom of silicon. This yields 66.7 at % oxygen. Chalcogens also include oxides, sulfides (sulfur compounds), selenides, tellurides, and polonides. The image shows native sulfur, yellow, and calcite crystals, clear or white. Credit: Didier Descouens. This shows sulfur crystals from the Smithsonian Institution. Credit: Deglr6328. Native sulfur is a naturally occurring chalcogen mineral. 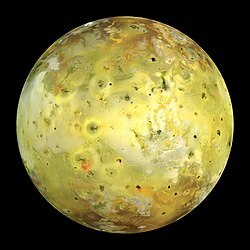 On Io as shown second down on the right, native sulfur occurs in yellow and red allotropes. Covellite specimen is from the Leonard Mine, Butte, Butte District, Silver Bow County, Montana, USA. Credit: Didier Descouens. Covellite is a copper sulfide (CuS) mineral. Covellite has been found in veins at depths of 1,150 meters, as the primary mineral. Covellite formed as clusters in these veins reaching one meter across. These are bronze to brass-yellow, striated, cyclically-twinned cubanite crystals from the Chibougamau mines of Quebec. Credit: Rob Lavinsky. Cubanite is a yellow mineral of copper, iron, and sulfur, CuFe2S3. Cubanite occurs in high temperature hydrothermal deposits with pyrrhotite and pentlandite as intergrowths with chalcopyrite. It results from exsolution from chalcopyrite at temperatures below 200 to 210 °C. It has also been reported from carbonaceous chondrite meteorites. The mineral orpiment from an arsenic mine in southern Russia is a source of yellow and orange pigments and is highly toxic. Credit: . The mineral orpiment at right is a source of yellow and orange pigments. Pyrite cubic crystals are on marl from Navajún, Rioja, Spain. Credit: . The mineral pyrite, or iron pyrite, is an iron sulfide with the formula FeS2. This mineral's metallic luster and pale brass-yellow hue have earned it the nickname fool's gold because of its superficial resemblance to gold. Pyrite is the most common of the sulfide minerals [on Earth]. Pyrite is usually found associated with other sulfides or oxides in quartz veins, sedimentary rock, and metamorphic rock, as well as in coal beds, and as a replacement mineral in fossils. Despite being nicknamed fool's gold, pyrite is sometimes found in association with small quantities of gold. Gold and arsenic occur as a coupled substitution in the pyrite structure. In the Carlin–type gold deposits, arsenian pyrite contains up to 0.37 wt% gold. This is mineral potassium chloride, rock salt, or sylvite. Credit: André Karwath, Aka. Def. any "element of group 7, i.e. fluorine, chlorine, bromine, iodine and astatine, which form a salt by direct union with a metal" is called a halogen. The mineral on the right is a KCl mineral called sylvite. Fluorescing fluorite is from Boltsburn Mine Weardale, North Pennines, County Durham, England, UK. Credit: . These are cyan colored fluorite crystals from Rogerley Mine, Frosterley, Weardale, North Pennines, Co. Durham, England, UK. Credit: Parent Géry. Fluorite is a mineral composed of NaF. Although fluorite usually appears violet or purple in color, the crystals at left are cyan with some blue or violet fluorite mixed in suggesting slight variations in composition. An uncommon slabbed and polished specimen of lustrous, metallic, elemental native iron in basalt from Germany. Credit: Robert Lavinsky. Def. "any of the group or metallic elements that have an incomplete inner (d) electron shell; they have multiple valencies and form coloured compounds and stable complex ions; the elements scandium to copper and those lying below them in the periodic table" is called a transition element, or transition metal. Transition metals are often restricted to manganese (Mn), iron (Fe), cobalt (Co), nickel (Ni), copper (Cu), and zinc (Zn), but generally include Sc through zinc (Zn), Y through cadmium (Cd), lanthanum through mercury, actinium through copernicium (Cn). Kamacite, Nantan (Nandan) iron meteorites, Nandan County, Guangxi Zhuang Autonomous Region, China. Size: 4.8×3.0×2.8 cm. Credit: . Kamacite is an alloy of iron and nickel, which is only found on earth in meteorites. The proportion iron:nickel is between 90:10 to 95:5; small quantities of other elements, such as cobalt or carbon may also be present. The mineral has a metallic luster, is gray and has no clear cleavage although the structure is isometric-hexoctahedral. Its density is around 8 g/cm³ and its hardness is 4 on the Mohs scale. It is also sometimes called balkeneisen. The Nantan irons, a piece is on the right, a witnessed fall in 1516, have a composition of 92.35% iron and 6.96% nickel. Taenite (Fe,Ni) is a mineral found naturally on Earth mostly in iron meteorites. It is an alloy of iron and nickel, with[nickel proportions of 20% up to 65%. Taenite is one of four known Fe-Ni meteorite minerals: The others are kamacite, tetrataenite, and antitaenite. It is opaque with a metallic grayish to white color. The structure is isometric-hexoctahedral. Its density is around 8 g/cm³ and hardness is 5 to 5.5 on the Mohs scale. Taenite is magnetic. The crystal lattice has the c≈a= 3.582Å±0.002Å. The Strunz classification is I/A.08-20, while the Dana classification is 1.1.11.2. It is a Hexoctahedral (cubic) in structure. Tetrataenite is a native metal found in meteorites with the composition FeNi. It is one of the mineral phases found in meteoric iron. Antitaenite is a meteoritic metal alloy mineral composed of iron and nickel, 20-40% Ni (and traces of other elements) that has a face centered cubic crystal structure. ... [It exists] as a new mineral species occurring in both iron meteorites and in chondrites ... The pair of minerals antitaenite and taenite constitute the first example in nature of two minerals that have the same crystal structure (face centered cubic) and can have the same chemical composition (same proportions of Fe and Ni) - but differ in their electronic structures: taenite has a high magnetic moment whereas antitaenite has a low magnetic moment. [This difference] arises from a high-magnetic-moment to low-magnetic-moment transition occurring in the Fe-Ni bi-metallic alloy series. Hematite is a blood colored ore. Credit: . Hematite is the mineral form of iron(III) oxide (Fe2O3), one of several iron oxides. Hematite is colored black to steel or silver-gray, brown to reddish brown, or red. Huge deposits of hematite are found in banded iron formations. The image shows pale-yellow microlite on lepidolite. Credit: Rob Lavinsky. Microlite is composed of sodium calcium tantalum oxide with a small amount of fluorine (Na,Ca)2Ta2O6(O,OH,F). Microlite is a mineral in the pyrochlore group that occurs in pegmatites and constitutes an ore of tantalum. It has a Mohs hardness of 5.5 and a variable specific gravity of 4.2 to 6.4. It occurs as disseminated microscopic subtranslucent to opaque octahedral crystals with a refractive index of 2.0 to 2.2. Microlite is also called djalmaite. Microlite occurs as a primary mineral in lithium-bearing granite pegmatites, and in miarolitic cavities in granites. This is an image of a naturally occurring gold nugget. Credit: USGS. Def. a "rare metallic chemical element of high economic value" is called a precious metal. This is a cadmium-containing mineral cadmoindite. Credit: David Hospital. Def. any "metal that has a specific gravity greater than about 5" is called a heavy metal. Heavy metals usually includes cadmium, indium, tin, antimony, mercury, thallium, lead, and bismuth. Heavy metals are mercury (Hg) through polonium (Po), copernicium (Cn) through livermorium (Lv). The cadmoindite specimen on the right has about 28.6 at % cadmium. This is a specimen of Breithauptite on calcite from the Samson Mine, St Andreasberg, Harz Mountains, Lower Saxony, Germany. Credit: Leon Hupperichs. Breithauptite is a nickel antimonide mineral with the simple formula NiSb. Breithauptite is a metallic opaque copper-red mineral crystallizing in the hexagonal - dihexagonal dipyramidal crystal system. It is typically massive to reniform in habit, but is observed as tabular crystals. It has a Mohs hardness of 3.5 to 4 and a specific gravity of 8.23. It occurs in hydrothermal calcite veins associated with cobalt–nickel–silver ores. Cinnabar is a naturally occurring cochineal-red, towards brownish red and lead-gray, mercury-sulfide mineral. Credit: H. Zell. Cinnabar or cinnabarite (red mercury(II) sulfide (HgS), native vermilion), is the common ore of mercury. Its color is cochineal-red, towards brownish red and lead-gray. Cinnabar [may be] found in a massive, granular or earthy form and is bright scarlet to brick-red in color. Generally cinnabar occurs as a vein-filling mineral associated with recent volcanic activity and alkaline hot springs. Cinnabar is deposited by epithermal ascending aqueous solutions (those near surface and not too hot) far removed from their igneous source. This Crocoite specimen is from the Red Lead Mine, Tasmania, Australia. Credit: . A sample of crocoite crystals from Dundas extended mine in Tasmania and is used to make the first synthetic orange pigment, chrome orange. Credit: . "Crocoite is a mineral consisting of lead chromate, PbCrO4. Crystals are of a bright hyacinth-red color. Relative rarity of crocoite is connected with specific conditions required for its formation: an oxidation zone of lead ore bed and presence of ultramafic rocks serving as the source of chromium (in chromite). The second crocoite on the right from Dundas extended mine in Tasmania is used to make the first synthetic orange pigment, chrome orange. "Indium minerals are very rare ; only 7 species have been defined so far : roquesite, CuInS2 (Picot & Pierrot, 1963) ; indite, FeIn2S4, and dzhalindite, In(OH)3 (Genkin & Murav'eva, 1963) ; sakuraiite, (Cu,Fe,Zn)3(In,Sn)S4 (Kato, 1965) ; native indium (Ivanov, 1966b) ; yixunite, PtIn (Yu Tsu-Hsiang et al., 1976) ; petrukite, (Cu,Fe,Zn,Ag)3(Sn,In)S4 (Kissin & Owens, 1989)." This is a specimen of gadolinite. Credit: WesternDevil. Def. "naturally occurring oxides of the lanthanide metals" are called rare earths. Gadolinite on the right often contains a variety of rare earth elements. This specimen of thorianite is from th Ambatofotsy pegmatite in Madagascar. Credit: Robert Lavinsky. Thorianite is a rare thorium oxide mineral, ThO2. It has a high percentage of thorium; it also contains the oxides of uranium, lanthanum, cerium, praseodymium and neodymium. The mineral is slightly less radioactive than pitchblende, but is harder to shield due to its high energy gamma rays. It is common in the alluvial gem-gravels of Sri Lanka, where it occurs mostly as water worn, small, heavy, black, cubic crystals. This gamma-ray spectrum contains the typical isotopes of the uranium-radium decay line. Credit: Wusel007. Elements usually emit a gamma-ray during nuclear decay or fission. The gamma-ray spectrum at right shows typical peaks for 226Ra, 214Pb, and 214Bi. These isotopes are part of the uranium-radium decay line. As 238U is an alpha-ray emitter, it is not shown. The peak at 40 keV is not from the mineral. From the color of the rock shown the yellowish mineral is likely to be autunite. Autunite occurs as an oxidizing product of uranium minerals in granite pegmatites and hydrothermal deposits. The Carnotite is from the Happy Jack Mine, Utah. Credit: USGS. Carnotite is a potassium uranium vanadate radioactive mineral with chemical formula: K2(UO2)2(VO4)2·3H2O. The water content can vary and small amounts of calcium, barium, magnesium, iron, and sodium are often present. Carnotite is a bright to greenish yellow mineral that occurs typically as crusts and flakes in sandstones. Amounts as low as one percent will color the sandstone a bright yellow. The high uranium content makes carnotite an important uranium ore and also radioactive. It is a secondary vanadium and uranium mineral usually found in sedimentary rocks in arid climates. It is an important ore of uranium in the Colorado Plateau region of the United States where it occurs as disseminations in sandstone and concentrations around petrified logs. This is an image of the mineral pitchblende, or uraninite. Credit: Geomartin. These crystals are uraninite from Trebilcock Pit, Topsham, Maine. Credit: Robert Lavinsky. Uraninite is a radioactive, uranium-rich mineral and ore with a chemical composition that is largely UO2, but also contains UO3 and oxides of lead, thorium, and rare earth elements. It is most commonly known as pitchblende (from pitch, because of its black color. All uraninite minerals contain a small amount of radium as a radioactive decay product of uranium. Uraninite also always contains small amounts of the lead isotopes 206Pb and 207Pb, the end products of the decay series of the uranium isotopes 238U and 235U respectively. The extremely rare element technetium can be found in uraninite in very small quantities (about 0.2 ng/kg), produced by the spontaneous fission of uranium-238. The image at left shows well-formed crystals of uraninite. The image at right shows botryoidal unraninite. Because of the uranium decay products, both sources are gamma-ray emitters. Torbernitte is a hydrated green copper uranyl phosphate mineral. Credit: Didier Descouens. Torbernite is a radioactive, hydrated green copper uranyl phosphate mineral, found in granites and other uranium-bearing deposits as a secondary mineral. Torbernite is isostructural with the related uranium mineral, autunite. The chemical formula of torbenite is similar to that of autunite in which a Cu2+ cation replaces a Ca2+. The number of water hydration molecules can vary between 12 and 8, giving rise to the variety of metatorbernite when torbernite spontaneously dehydrates. Uranophane is a calcium uranium silicate hydrate mineral. Credit: United States Geological Survey. Uranophane Ca(UO2)2(SiO3OH)2·5H2O is a rare calcium uranium nesosilicate hydrate mineral that forms from the oxidation of uranium bearing minerals. Uranophane is also known as uranotile. It has a yellow color and is radioactive. This mineral, Aeschynite, probably contains on the order of a few atoms of neptunium at any one time, as part of the complex decay chain of the uranium that makes up a much larger fraction of the sample. Credit: Theodore Gray. Def. any naturally occurring element "lying beyond uranium in the periodic table; having an atomic number greater than 92" is called a transuranic. Minerals containing transuranics are not rare. But, the stability of such isotopes makes it unlikely to find large concentrations of specific elements. The transuranics start after uranium (U) in the periodic table. They include the named elements: plutonium (Pu), americium (Am), curium (Cm), berkelium (Bk), californium (Cf), einsteinium (Es), fermium (Fm), mendelevium (Md), nobelium (No), lawrencium (Lr), rutherfordium (Rf), dubnium (Db), seaborgium (Sg), bohrium (Bh), hassium (Hs), meitnerium (Mt), darmstadtium (Ds), roentgenium (Rg), copernicium (Cn), flerovium (Fl), and livermorium (Lv). This is a naturally occurring collection of intergrown feldspar crystals. Credit: Dave Dyet. Def. any "salt of silica or of one of the silicic acids" is called a silicate. Silicate minerals are those with more atomic percent silicon oxide than other constituent elements. For example, kaolinite is Al2Si2O5(OH)4. If aluminum (Al) at two atoms per molecular unit were the most numerous element, kaolinite would be an aluminide. As the most numerous element is oxygen at 9 for 52.9 at %, kaolin is an oxide. The crystal structure consists of a sheet of interconnected silica tetrahedra. So, kaolin is a phyllosilicate. This is a specimen of Wollastonite. Credit: USGS. Def. the "oxyanion of silicon SiO32- or any salt or mineral containing this ion" is called a metasilicate. Sphene is widely distributed as an accessory mineral in intermediate and felsic plutonic rocks, pegmatites and alpine veins. Credit: Martine van der Westhuizen. Def. "any simple silicate mineral in which the SiO4 tetrahedra are isolated and have metal ions as neighbours" is called a neosilicate. Def. a "type of silicate crystal structure characterized by the linking of SiO4 tetrahedra through other cations rather than the sharing of oxygens among SiO4 tetrahedra" is called a nesosilicate. Nesosilicates (lone tetrahedron) - [SiO4]4−, e.g. olivine, tephroite. This is Andradite Var: Demantoid garnet an orthosilicate. Credit: yaiba0390. Def. "any salt or ester of orthosilicic acid, (M+)4SiO44− or Si(OR)4" or "any silicate mineral, such as garnet or olivine, in which the SiO4 tetrahedra do not share oxygen atoms with each other" is called an orthosilicate. This image is a visual close up of green sand which is actually olivine crystals that have been eroded from lava rocks. Credit: Brocken Inaglory. This is a visual image of a forsterite crystal. Credit: Azuncha. Def. any "of a group of olive green magnesium-iron" orthosilicates "that crystallize in the orthorhombic system" is called an olivine. At right is a visual close up of green sand which is actually olivine crystals that have been eroded from lava rocks. Some olivine crystals are still inside the lava rock. Forsterite (Mg2SiO4) is the magnesium rich end-member of the olivine solid solution series. Rhodolite is the rose-pink to red mineral, a type of garnet, in this magnesium iron aluminum silicate mineral. Credit: Dave Dyet. Chemically, rhodolite is an iron-magnesium-aluminium silicate, [(Mg,Fe)3Al2(SiO4)3,] part of the pyrope-almandine solid-solution series, with an approximate garnet composition of Py70Al30. This image shows yellow-brown spurrite from New Mexico, USA. Credit: Dave Dyet. Spurrite is a nesosilicate that can occur naturally as a yellow mineral. Its chemical formula is Ca5(SiO4)2CO3. Spurrite is generally formed in contact metamorphism zones as mafic magmas are intruded into carbonate rocks. At the center of this image are yellowish crystals of the sorosilicate mineral leucophanite. Credit: Parent Géry. Def. any group of silicates that have structurally isolated double tetrahedra is called a sorosilicate. Def. any group of silicates that have structurally isolated double tetrahedra (the dimeric anion Si2O76-) is called a sorosilicate. Sorosilicates (double tetrahedra) - [Si2O7]6−, e.g. epidote, melilite group, leucophanite. Axinite is a calcium aluminum borosilicate mineral that can occur in violet. Credit: Didier Descouens. The tanzanite shown is a rough stone and a cut stone. Credit: Didier Descouens. A rough sample of tanzanite is pictured. Credit: Wela49. On the right is both a rough stone and a cut stone of tanzanite. Tanzanite is the blue/purple variety of the mineral zoisite (a calcium aluminium hydroxy silicate) with the formula (Ca2Al3(SiO4)(Si2O7)O(OH))]. Tanzanite is noted for its remarkably strong trichroism, appearing alternately sapphire blue, violet and burgundy depending on crystal orientation. Tanzanite can also appear differently when viewed under alternate lighting conditions. The blues appear more evident when subjected to fluorescent light and the violet hues can be seen readily when viewed under incandescent illumination. A rough violet sample of tanzanite is third down at left. Tanzanite in its rough state is usually a reddish brown color. It requires artificial heat treatment to 600 °C in a gemological oven to bring out the blue violet of the stone. Tanzanite is found only in the foothills of Mount Kilimanjaro. Tanzanite is universally heat treated in a furnace, with a temperature between 550 and 700 degrees Celsius, to produce a range of hues between bluish-violet to violetish-blue. Some stones found close to the surface in the early days of the discovery were gem-quality blue without the need for heat treatment. Photograph is of a dioptase specimen from Altyn Tübe, Kazakhstan. Credit: Dlloyd. 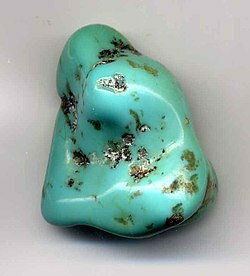 Aquamarine is a blue or turquoise variety of beryl. Credit: . Def. any group of silicates that have a ring of linked tetrahedra is called a cyclosilicate. Beryl of various colors is found most commonly in granitic pegmatites, but also occurs in mica schists. Goshenite a beryl clear to white cyclosilicate is found to some extent in almost all beryl localities. Cyclosilicates (rings) - [SinO3n]2n−, e.g. tourmaline group. The gem-gravel placer deposits of Sri Lanka contain aquamarine. The deep blue version of aquamarine is called maxixe. Maxixe is commonly found in the country of Madagascar. Its color fades to white when exposed to sunlight or is subjected to heat treatment, though the color returns with irradiation. The pale blue color of aquamarine is attributed to Fe2+. The Fe3+ ions produce golden-yellow color, and when both Fe2+ and Fe3+ are present, the color is a darker blue as in maxixe. Decoloration of maxixe by light or heat thus may be due to the charge transfer Fe3+ and Fe2+. Dark-blue maxixe color can be produced in green, pink or yellow beryl by irradiating it with high-energy particles (gamma rays, neutrons or even X-rays). Eudialyte is a somewhat rare, red silicate mineral. Credit: Baryonyx. Eudialyte is a somewhat rare, red silicate mineral, which forms in alkaline igneous rocks, such as nepheline syenites. Augite is a black, single-chain inosilicate mineral, a pyroxene. Credit: Didier Descouens. Def. "any silicate having interlocking chains of silicate tetrahedra" is called an inosilicate. Inosilicates (single chain) - [SinO3n]2n−, e.g. pyroxene group. This very rare, sharp, complete-all-around pyroxene is circa mid to late 1800s. Credit: Robert Lavinsky. The pyroxenes are a group of important rock-forming inosilicate minerals found in many igneous and metamorphic rocks. They share a common structure consisting of single chains of silica tetrahedra and they crystallize in the monoclinic and orthorhombic systems. Pyroxenes have the general formula XY(Si,Al)2O6 (where X represents calcium, sodium, iron+2 and magnesium and more rarely zinc, manganese and lithium and Y represents ions of smaller size, such as chromium, aluminium, iron+3, magnesium, manganese, scandium, titanium, vanadium and even iron+2). Although aluminium substitutes extensively for silicon in silicates such as feldspars and amphiboles, the substitution occurs only to a limited extent in most pyroxenes. At right is an image of a very rare, sharp, complete-all-around pyroxene is from Ducktown District, Polk County, Tennessee, USA, circa mid to late 1800s. Anthophyllite (or asbestos) commonly occurs as a gray or white, double-chain inosilicate mineral. Credit: Aramgutang. Often a mineral appears blue due to the presence of copper or sulfur. Glaucophane is a blue silicate that owes its color to its characteristic formation. Inosilicates(double chain) - [Si4nO11n]6n−, e.g. amphibole group. This image shows several amphibole crystals in a glass bowl. Credit: Karelj. Y is Al, Mg, or Fe or less commonly Mn, Cr, Ti, Li, etc. This is a specimen of glaucophane with fuchsite. Credit: Didier Descouens. Glaucophane is a mineral belonging to the amphibole group, chemical formula Na2Mg3Al2Si8O22(OH)2. The blue color is very diagnostic for this species. It, along with the closely related mineral riebeckite are the only common amphibole minerals that are typically blue. Glaucophane forms in metamorphic rocks that are either particularly rich in sodium or that have experienced low temperature-high pressure metamorphism such as would occur along a subduction zone. This material has undergone intense pressure and moderate heat as it was subducted downward toward the mantle. It is glaucophane's color that gives the blueschist facies its name. Glaucophane is also found in eclogites that have undergone retrograde metamorphism. Kaolin is a white phyllosilicate. Credit: USGS and the Minerals Information Institute. Biotite is a black phyllosilicate mineral. Credit: United States Geological Survey and the Mineral Information Institute. Def. any "silicate mineral having a crystal structure of parallel sheets of silicate tetrahedra" is called a phyllosilicate. Phyllosilicates (sheets) - [Si2nO5n]2n−, e.g. micas and clays like Kaolin. Lavender lepidolite has been found in the Himalaya Mine, Mesa Grande District, San Diego County, California, USA. Credit: Rob Lavinsky. Lepidolite (KLi2Al(Al,Si)3O10(F,OH)2 is a lilac-gray or rose-colored member of the mica group that is a secondary source of lithium. It is a phyllosilicate mineral and a member of the polylithionite-trilithionite series. It occurs in granite pegmatites, in some high-temperature quartz veins, greisens and granites. Associated minerals include quartz, feldspar, spodumene, amblygonite, tourmaline, columbite, cassiterite, topaz and beryl. Here is mica in a rock. Credit: Rpervinking. Colorless sharply formed undamaged crystals of analcime to 25 mm in diameter on a 78 mm x 65 mm x 53 mm matrix. Credit: Carles Millan. Def. type "of silicate crystal structure characterized by the sharing of all SiO4 tetrahedral oxygens resulting in three-dimensional framework structures" is called a tektosilicate. Def. any "of various silicate minerals ... with a three-dimensional framework of silicate tetrahedra" is called a tectosilicate. Tectosilicates (3D framework) - [AlxSiyO2(x+y)]x−, e.g. quartz, feldspars, zeolites. Def. a continuous framework, tectosilicate of SiO4 silicon–oxygen tetrahedra, with each oxygen being shared between two tetrahedra, giving an overall chemical formula of SiO2 of trigonal trapezohedral class 3 2, usually with some substitutional or interstitial impurities, is called α-quartz. When the concentration of interstitial or substitutional impurities becomes sufficient to change the space group of a mineral such as α-quartz, the result is another mineral. When the physical conditions are sufficient to change the solid space group of α-quartz without changing the chemical composition or formula, another mineral results. Shocked quartz is associated with two high pressure polymorphs of silicon dioxide: coesite and stishovite. These polymorphs have a crystal structure different from standard quartz. Again, this structure can only be formed by intense pressure, but moderate temperatures. High temperatures would anneal the quartz back to its standard form. Beta quartz (β-Quartz) is stable "between 573° and 870°C". Def. a polymorph of α-quartz formed at an estimated minimum pressure of 35 GPa up to pressures above 40 GPa with a orthorhombic space group Pmmm no. 47 is called seifertite. Specimen consists of "porcelainite" - a semivitrified chert- or jasper-like rock composed of cordierite, mullite and tridymite, admixture of corundum, and subordinate K-feldspar. Credit: John Krygier. Def. a polymorph of α-quartz formed at temperatures from 22-460°C with at least seven space groups for its forms with tabular crystals, or a "rare mineral of volcanic rocks that solidified at a high temperature, with the chemical composition silicon dioxide, SiO2, [...] chemically identical to quartz, but has a different crystal structure" is called tridymite. Alpha-quartz (space group P3121, no. 152, or P3221, no. 154) under a high pressure of 2-3 gigapascals and a moderately high temperature of 700°C changes space group to monoclinic C2/c, no. 15, and becomes the mineral coesite. Def. a "high-pressure polymorph of silica found in extreme conditions such as the impact craters of meteorites, with the chemical composition of silicon dioxide, SiO2" is called coesite. Def. a polymorph of α-quartz formed by pressures > 100 kbar or 10 GPa and temperatures > 1200 °C, or a "fine-grained mineral, SiO2, that is a polymorphic form of quartz formed under very high pressure" is called stishovite. Stishovite may be formed by an instantaneous over pressure such as by an impact or nuclear explosion type event. Minute amounts of stishovite has been found within diamonds. Cristobalite spheres appear within obsidian. Credit: Rob Lavinsky. Sample has blue sodalite. Credit: Ra'ike. Sodalite is a rich royal blue mineral. Massive sodalite samples are opaque, crystals are usually transparent to translucent. Occurring typically in massive form, sodalite is found as vein fillings in plutonic igneous rocks such as nepheline syenites. Lazurite is a deep blue tectosilicate. Credit: Didier Descouens. Lazurite is a tectosilicate mineral with sulfate, sulfur and chloride with formula: (Na,Ca)8[(S,Cl,SO4,OH)2|(Al6Si6O24)]. It is a feldspathoid and a member of the sodalite group. The colour is due to the presence of S3- anions. Lazurite is a product of contact metamorphism of limestone. This feldspar crystal is stark white showing excellent symmetry with appropriate faces. Credit: Rob Lavinsky. Def. any "of a large group of ... aluminum [tectosilicates] of the alkali metals sodium, potassium, calcium and barium" is called feldspar. Def. any of a group of silicates "that did not contain enough silica to satisfy all the chemical bonds" of the framework is called a feldspathoid. Def. any "of a group of aluminum silicate feldspathic minerals ranging in their ratio of calcium to sodium" is called plagioclase. This is a specimen of Haüyne on augite from the Somma-Vesuvius Complex, Naples Province, Italy. Credit: . Hauyne, haüyne or hauynite occurs in Vesuvian lavas in Monte Somma, Italy. It is a tectosilicate mineral with sulfate, with endmember formula Na3Ca(Si3Al3)O12(SO4). It is a feldspathoid and a member of the sodalite group. Haüyne occurs in phonolites and related leucite- or nepheline-rich, silica-poor, igneous rocks; less commonly in nepheline-free extrusives and metamorphic rocks (marble). This is an image of columnar ice crystals. Credit: DrAlzheimer. Def. any frozen "volatile chemical, such as water, ammonia, or carbon dioxide" is called an ice. This image shows the blue water ice, or blue ice, of a glacier. Credit: . Def. "a very large water ice object that falls from the sky, similar in composition to hailstones" is called a megacryometeor. Def. "pieces of ice falling as precipitation" are called hail. Def. a "single ball of hail" is called a hailstone. Blue ice occurs when snow falls on a glacier, is compressed, and becomes part of a glacier ... blue ice was observed in Tasman Glacier, New Zealand in January 2011. Ice is blue for the same reason water is blue: it is a result of an overtone of an oxygen-hydrogen (O-H) bond stretch in water which absorbs light at the red end of the visible spectrum. Def. an "experimental science of determining the arrangement of atoms in solids", or the "study of crystals" is called crystallography. 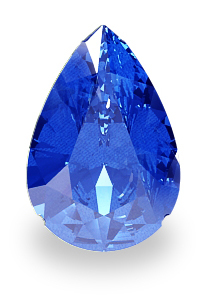 This is a tear-drop gem of blue sapphire. Credit: LesFacettes. Many minerals occur in large enough crystals to be considered gems. Def. a "precious stone, usually of substantial monetary value or prized for its beauty or shine" is called a gem. Def. the "art and science of gems" is called gemology. This is a specimen of obsidian from Lake County, Oregon. Credit: Locutus Borg. Limonite is an amorphous mineraloid of a range of hydrated iron oxides. Credit: USGS. Def. a "substance that resembles a mineral but does not exhibit crystallinity" is called a mineraloid. Def. a "chemical element existing in an uncombined state in nature" is called a native element. Def. a naturally occurring, silvery-colored, metallic liquid, composed primarily of the chemical element mercury, is called mercury, or native mercury. Def. a "small, round, dark glassy object, composed of silicates" is called a tektite. Def. a "hard, generally yellow to brown translucent fossil resin" is called an amber. Def. a naturally occurring black glass is called an obsidian. Def. a naturally occurring, hydrous, noncrystalline or amorphous form of silica, where 3% to 21% of the total weight is water, of the chemical formula SiO2·nH2O is called an opal. Def. a "flammable liquid ranging in color from clear to very dark brown and black, consisting mainly of hydrocarbons, occurring naturally in deposits under the Earth's surface" is called petroleum. Limonite is an iron ore consisting of a mixture of hydrated iron(III) oxide-hydroxides in varying composition. The generic formula is frequently written as FeO(OH)·nH2O, although this is not entirely accurate as the ratio of oxide to hydroxide can vary quite widely. Limonite is one of the two principle iron ores, the other being hematite, and has been mined for the production of iron since at least 2500 BCE. Although originally defined as a single mineral, limonite is now recognized as a mixture of related hydrated iron oxide minerals, among them goethite, akaganeite, lepidocrocite, and jarosite. Individual minerals in limonite may form crystals, but limonite does not, although specimens may show a fibrous or microcrystalline structure, and limonite often occurs in concretionary forms or in compact and earthy masses; sometimes mammillary, botryoidal, reniform or stalactitic. Because of its amorphous nature, and occurrence in hydrated areas limonite often presents as a clay or mudstone. However there are limonite pseudomorphs after other minerals such as pyrite. This means that chemical weathering transforms the crystals of pyrite into limonite by hydrating the molecules, but the external shape of the pyrite crystal remains. Limonite pseudomorphs have also been formed from other iron oxides, hematite and magnetite; from the carbonate siderite and from iron rich silicates such as almandine garnets. Limonite usually forms from the hydration of hematite and magnetite, from the oxidation and hydration of iron rich sulfide minerals, and chemical weathering of other iron rich minerals such as olivine, pyroxene, amphibole, and biotite. It is often the major iron component in lateritic soils. One of the first uses was as a pigment. The yellow form produced yellow ochre for which Cyprus was famous. Rock outcrop occurs along a mountain creek near Orosí, Costa Rica. Credit: . a "naturally occurring aggregate of minerals"
Determining mineral crystal structures requires much less expertise than large organic molecular crystals. ↑ mineral. San Francisco, California: Wikimedia Foundation, Inc. August 29, 2013. Retrieved 2013-08-30. ↑ metal. San Francisco, California: Wikimedia Foundation, Inc. 2 January 2015. Retrieved 2015-01-04. ↑ metalloid. San Francisco, California: Wikimedia Foundation, Inc. 4 December 2014. Retrieved 2015-02-22. ↑ Stuart J. Mills, Frédéric Hatert, Ernest H. Nickel, and Giovanni Ferraris (2009). "The standardisation of mineral group hierarchies: application to recent nomenclature proposals". European Journal of Mineralogy 21: 1073-80. doi:10.1127/0935-1221/2009/0021-1994. http://nrmima.nrm.se//Mills%20et%20al%202009%20Groups%20EJM%20October.pdf. Retrieved 2015-02-22. ↑ payam (30 July 2013). Top 10 Hardest Material in the world. Help Tips. Retrieved 2015-07-30. ↑ diamond. San Francisco, California: Wikimedia Foundation, Inc. October 16, 2012. Retrieved 2012-10-23. ↑ Malachite. WebExhibits. 2001. Retrieved 2007-12-08. ↑ aluminide. San Francisco, California: Wikimedia Foundation, Inc. 31 March 2014. Retrieved 2015-02-22. ↑ 10.0 10.1 J. Theo Kloprogge, Loc V. Duong, Barry J. Wood, and Ray L. Frost (15 April 2006). "XPS Study of the Major Minerals in Bauxite: Gibbsite, Bayerite, and (Pseudo-) Boehmite". Journal of Colloid and Interface Science 296 (2): 572-6. doi:10.1016/j.jcis.2005.09.054. http://eprints.qut.edu.au/3933/1/3933.pdf. Retrieved 2015-02-22. ↑ Sue Lavoie (September 30, 1999). PIA02500: Sulfuric Acid on Europa. Washington DC USA: NASA's Office of Space Science. Retrieved 2013-06-24. ↑ halogen. San Francisco, California: Wikimedia Foundation, Inc. 29 December 2014. Retrieved 2015-01-04. ↑ transition element. San Francisco, California: Wikimedia Foundation, Inc. 10 December 2014. Retrieved 2015-02-22. ↑ Albertsen, F.; Knudsen, J. M.; Jensen, G. B. (Jun). "Structure of taenite in two iron meteorites J.". Nature 273 (5662): 453–454. doi:10.1038/273453a0. ↑ K. Lagarec, D.G. Rancourt, S.K. Bose, B. Sanyal, and R.A. Dunlap. Observation of a composition-controlled high-moment/low-moment transition in the face centered cubic Fe-Ni system: Invar effect is an expansion, not a contraction. Journal of Magnetism and Magnetic Materials 236 (2001) 107-130. ↑ precious metal. San Francisco, California: Wikimedia Foundation, Inc. 10 January 2014. Retrieved 2015-01-04. ↑ heavy metal. San Francisco, California: Wikimedia Foundation, Inc. 6 June 2014. Retrieved 2015-02-22. ↑ R. J. King (2002). "Minerals Explained 37: Cinnabar". Geology Today 18 (5): 195–9. doi:10.1046/j.0266-6979.2003.00366.x. ↑ Nilson F. Botelho, Guy Roger, Ferdinand d'Yvoire, Yves Moẽlo and Marcel Volfinger (1994). "Yanomamite, InAsO4.2H2O, a new indium mineral from topaz-bearing greisen in the Gohiás Tin Province, Brazil". European Journal of Mineralogy 6: 245-54. https://rruff-2.geo.arizona.edu/uploads/EJM6_245.pdf. Retrieved 2015-02-22. ↑ rare earth. San Francisco, California: Wikimedia Foundation, Inc. 6 June 2014. Retrieved 2015-01-04. ↑ C. Frondel (1958). Systematic Mineralogy of Uranium and Thorium. United States Government Printing Office. ↑ transuranic. San Francisco, California: Wikimedia Foundation, Inc. 17 December 2014. Retrieved 2015-01-04. ↑ silicate. San Francisco, California: Wikimedia Foundation, Inc. 17 December 2014. Retrieved 2015-01-04. ↑ metasilicate. San Francisco, California: Wikimedia Foundation, Inc. June 20, 2013. Retrieved 2013-09-02. ↑ neosilicate. San Francisco, California: Wikimedia Foundation, Inc. June 15, 2013. Retrieved 2013-09-02. ↑ 39.0 39.1 orthosilicate. San Francisco, California: Wikimedia Foundation, Inc. June 16, 2013. Retrieved 2013-09-02. ↑ olivine. San Francisco, California: Wikimedia Foundation, Inc. August 30, 2012. Retrieved 2012-10-23. ↑ Ds. Lauretta, L.P. Keller, S. Messenger (2005). "Supernova olivine from cometary dust". Science 309 (5735): 737–741. doi:10.1126/science.1109602. PMID 15994379. ↑ sorosilicate. San Francisco, California: Wikimedia Foundation, Inc. June 19, 2013. Retrieved 2013-09-02. ↑ E. Skalwold. Pleochroism: trichroism and dichroism in gems. Nordskip.com. Retrieved 2011-08-29. ↑ YourGemologist / International School of Gemology Study of Heat Treatment. Yourgemologist.com. Retrieved 2011-08-29. ↑ Color in the Beryl group. Retrieved 2009-06-06. ↑ Ibragimova, E. M., Mukhamedshina, N. M., Islamov, A. Kh. (2009). "Correlations between admixtures and color centers created upon irradiation of natural beryl crystals". Inorganic Materials 45 (2): 162. doi:10.1134/S0020168509020101. ↑ R. R. Viana, G. M. Da Costa, E. De Grave, W. B. Stern, H. Jordt-Evangelista. "Characterization of beryl (aquamarine variety) by Mössbauer spectroscopy 2002". Physics and Chemistry of Minerals 29: 78. doi:10.1007/s002690100210. ↑ Ana Regina Blak, Sadao Isotani, Shigueo Watanabe. "Optical absorption and electron spin resonance in blue and green natural beryl: A reply 1983". Physics and Chemistry of Minerals 9 (6): 279. doi:10.1007/BF00309581. ↑ K. Nassau (1976). "The deep blue Maxixe-type color center in beryl". American Mineralogist 61: 100. http://www.minsocam.org/ammin/AM61/AM61_100.pdf. ↑ inosilicate. San Francisco, California: Wikimedia Foundation, Inc. 21 June 2013. Retrieved 2013-09-02. ↑ phyllosilicate. San Francisco, California: Wikimedia Foundation, Inc. June 17, 2013. Retrieved 2013-09-02. ↑ tectosilicate. San Francisco, California: Wikimedia Foundation, Inc. June 17, 2013. Retrieved 2013-09-02. ↑ Pinkfud (8 November 2004). tridymite. San Francisco, California: Wikimedia Foundation, Inc. Retrieved 2018-03-12. ↑ SemperBlotto (23 April 2007). coesite. San Francisco, California: Wikimedia Foundation, Inc. Retrieved 2012-10-23. ↑ SemperBlotto (4 November 2006). stishovite. San Francisco, California: Wikimedia Foundation, Inc. Retrieved 2018-03-12. ↑ R Wirth, C. Vollmer, F. Brenker, S. Matsyuk, F. Kaminsky. "Inclusions of nanocrystalline hydrous aluminium silicate "Phase Egg" in superdeep diamonds from Juina (Mato Grosso State, Brazil) 2007". Earth and Planetary Science Letters 259 (3–4): 384. doi:10.1016/j.epsl.2007.04.041. ↑ Pinkfud (8 November 2004). cristobalite. San Francisco, California: Wikimedia Foundation, Inc. Retrieved 2018-03-12. ↑ feldspar. San Francisco, California: Wikimedia Foundation, Inc. October 16, 2012. Retrieved 2012-10-23. ↑ Pinkfud (6 November 2004). feldspathoid. San Francisco, California: Wikimedia Foundation, Inc. Retrieved 2015-07-30. ↑ plagioclase. San Francisco, California: Wikimedia Foundation, Inc. October 16, 2012. Retrieved 2012-10-23. ↑ 71.0 71.1 71.2 Gaines 1997. Dana’s New Mineralogy Eighth Edition. New York: Wiley. ↑ 72.0 72.1 Hauyne. Mindat.org. Retrieved 11 August 2011. ↑ Hauyne. Webminerals. Retrieved 11 August 2011. ↑ ice. San Francisco, California: Wikimedia Foundation, Inc. 29 December 2014. Retrieved 2015-01-05. ↑ 76.66.203.138 (14 November 2010). megacryometeor. San Francisco, California: Wikimedia Foundation, Inc. Retrieved 2018-03-10. ↑ hail. San Francisco, California: Wikimedia Foundation, Inc. February 9, 2013. Retrieved 2013-02-15. ↑ hailstone. San Francisco, California: Wikimedia Foundation, Inc. December 26, 2012. Retrieved 2013-02-15. ↑ Harvey, Eveline (14 January 2011). NZ blue ice sighting an unexpected treat for tourists, In: The New Zealand Herald. Retrieved 21 September 2011. ↑ 81.0 81.1 crystallography. San Francisco, California: Wikimedia Foundation, Inc. August 29, 2013. Retrieved 2013-09-02. ↑ gem. San Francisco, California: Wikimedia Foundation, Inc. 16 November 2014. Retrieved 2015-01-04. ↑ gemology. San Francisco, California: Wikimedia Foundation, Inc. 9 December 2014. Retrieved 2015-01-04. ↑ mineraloid. San Francisco, California: Wikimedia Foundation, Inc. April 20, 2011. Retrieved 2012-10-23. ↑ tektite. San Francisco, California: Wikimedia Foundation, Inc. August 31, 2012. Retrieved 2012-10-23. ↑ amber. San Francisco, California: Wikimedia Foundation, Inc. 19 December 2014. Retrieved 2015-01-09. ↑ petroleum. San Francisco, California: Wikimedia Foundation, Inc. 16 July 2014. Retrieved 2015-01-09. ↑ Northrop, Stuart A. (1959). Limonite, In: Minerals of New Mexico (revised edition). Albuquerque, New Mexico: University of New Mexico Press. pp. 329–333. ↑ 93.0 93.1 rock. San Francisco, California: Wikimedia Foundation, Inc. October 23, 2012. Retrieved 2012-10-23. ↑ 193.203.81.129 (11 July 2005). rock. San Francisco, California: Wikimedia Foundation, Inc. Retrieved 2012-10-23. This page was last edited on 8 March 2019, at 22:49.